This kid has skillz. This masterpiece was whipped up by LIBBY, AE's kid. 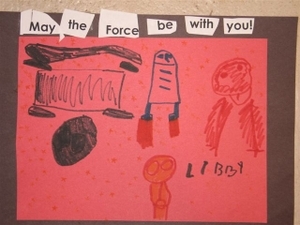 AE tells me that LIBBY is currently obsessed with any and all things Star Wars. I guess this obsession extends to "Show and Tell". Not sure if its called "Show and Tell" at that hippie, high on life school she goes to. LIBBY opted to bring her Darth Vader mask to show the class. FANTASTIC. I like how it touches on all elements pertaining to Star Wars. You have R2D2, C3PO, Vader, the Death Star, and I think the Millenium Falcon. The only thing its missing is a Wookie. Any day now I'm hoping to get her take on Empire Strikes Back in the mail. I can't wait to see her take on YODA. *Apparently it was the neighbor boy's birthday and this is the card she made for him. There is a video that goes with this, but I can't figure out how to put it in. Maybe LIBBY knows. If I figure it out I will add it. In it LIBBY plays the theme while her younger sister JACKIE yells "Play it LIBBY. Play it. That was amazing. "-no joke I nearly fell out of my chair at work while watching it. UPDATE: AE tells me there was more on the back....LIBBY was sending coded messages I guess.